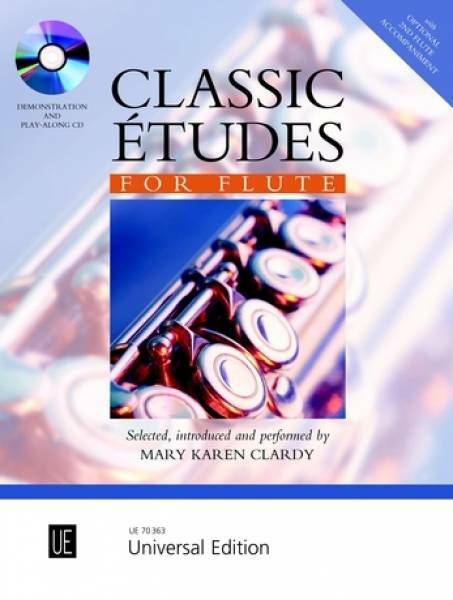 Continuing in the tradition of previous publications in the Classics series: Classic Solos and Classic Duets, Mary Karen Clardy has selected 24 of the most significant standard études from Carl Joachim Andersen's op. 21, 30, 33, 37 and 41, Antoine Benoit Tranquille Berbiguier's Studies and Ernesto Köhler's Romantic Études op. 66. Performance notes, composers' biographies and a glossary of terms are included providing helpful historical background to the pieces. An optional second flute part has been composed for each étude providing opportunities for the teacher or another player to support and reinforce phrasing, rhythm, tone quality, intonation and style. These parts may be downloaded for free from our website. The second flute parts have been recorded on the CD to provide supportive accompaniments for playing along - an invaluable aid in daily practice.